What first inspired you to become a film maker? I love watching movies & music since my early youth. At first I was producing (just smoking pot and flowing on beats) hip hop music in my youth together with friends and then we filmed music videos for our tracks and published them on the German rap platform rappers.in. Trough the music videos I was teaching myself amateur techniques about directing, cinematography, editing and everything. After that I began to produce gaming content on my own Youtube channel together with a friend of mine. Parallel I was searching for film projects to get involved, so I was getting involved in my first project as a producer, and after that several projects followed soon. As someone who has worked as a writer, director, producer and various other roles in the film making process, what would you say is your favorite job? There are so many jobs on the set I love when I make movies. But if I have to choose, It’s the directing part I would prefer. I think that there is nothing more exciting to see than how written ideas getting built into moving images filled with music. I love working with several actors and a good, working team. But in our budget class I am often forced to do more than one job at the same time. So I get used to it. And plus that, I also love the whole organization, production and planning stuff as a producer a lot. Could you tell us a bit about your upcoming film “Reyes”? As I am a character driven writer, I like to tell and build my stories out of my characters. And so Reyes is about a down at heel guy who gets into the vortex of a big secret society underground organization. He meets his old big love named LEYA who is a part of the trouble there and he wants to save her out of that. Step by step MICK (the main) realizes, that he has to get over his personal issues to gain enough power to handle the dark forces which are ruling his hometown. What inspired the idea behind “Reyes”? The first idea was to create a movie pitch in front of the background of the feasibility. I at first every time begin my stories with: It’s about a guy/girl who… and so I structured the story a little bit, and my co-writers René Wiesner and Peter Ahlers helped me coming along with that. After that and with every discussion about the characters and the story, the script grew bigger. While creating the idea I was inspired by genre movies like “the Ninth gate” or “Eyes Wide shut”, but also by a lot of other movies which include mysteries and riddles. What would you say is the most unique aspect of “Reyes”? What are your favorite types of films to make and why? I like many kinds of film projects, but I love developing and filming drama scenes, because there are so many emotions to transfer to the audience. I love discussions with actors about how to play the role and how to react in different situations. I also love to see how good actors can show several facets of their acting. Are there any directors or writers who you would say inspired your style of film making? I am a big fan of the older works of Roman Polanski, and of course everything by Werner Herzog. Also Scorcese inspired me a lot, but I also like the German director Akiz for his endurance and creativity. And of course I don’t forget the lots of German independent directors. If you had the opportunity to work on a film with any director (alive or dead) who would you pick? I would love to work together with Lars von Trier. Should be amazing to do this. What qualities do you think make a great film, and could you give us a few examples of films that you would consider great? What advice would you give to someone who wants to create an independent film of their own? As every experienced filmmaker would say: Just do it! The possibilities are much easier and cheaper to make movies, so go out and just create an interesting flick, guys! 12. 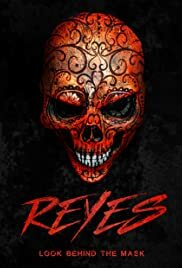 Where can we follow you to learn about “Reyes” and any projects that you will be working on in the future? Watch out & Thanks for the interview!